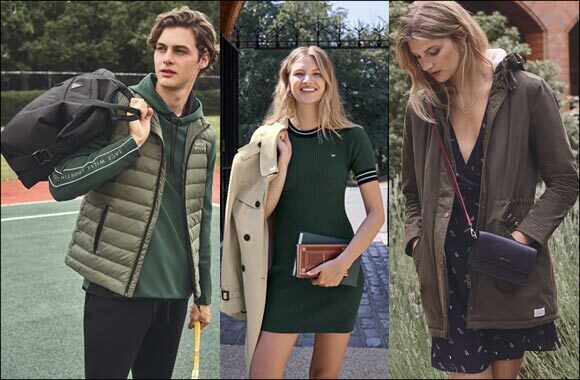 This autumn, step into the new collection for women with unapologetically British classics, new designs and signature Jack Wills pieces. Think carefully-constructed knitwear, investment-worthy outerwear and iconic, can’t-live-without hoodies. Heritage-inspired pieces paired back with chic sportswear is what Jack Wills does best – for example, take the Stanedge joggers together with a sleek Hillcrest track jacket. With autumn comes familiar and versatile colour palettes, across everyday essentials from the layer-ready Linwood and Rosefield knits to the down-filled Cartmell jacket. A focus on the technicality of outerwear is particularly prominent, for example, the limited-edition Blythe robe coat warms the wearer without burdening them with bulk or weight as well as new innovations in wool such as the standout Maltby bomber. The brand’s iconic pieces return with the Hazelwood parka and the classic Ambrose trench coat. This autumn, the Jack Wills men’s collection epitomises classic, British heritage-inspired design constructed from traditional and innovative fabrications of the highest quality. Invest in layering essentials and key transitional outerwear – think functional down-filled jackets to protect against the cold as well as the versatile Knole gilet in updated colours. Wool makes a comeback across classic knitwear heroes. The brand’s experiments in wool innovation result in a diverse array of mixes and textures, perfect for layering, in patchwork and cable knits with fine Merino yarns. Iconic hoodies and sweatshirts take centre-stage with a seasonal graphic update, for example, the Bennidale crew nods to the brand’s varsity roots while the Etitude crew, reminds us that coats aren’t the only option for ‘outerwear’. Another essential for autumn is a sturdy, travel-ready backpack and accessories which have been finished with extra-secure compartments and fastenings for an easy and organised season. Established in 1999, as a single shop in the seaside town of Salcombe, Jack Wills is a British premium fashion and lifestyle brand. Known for its high quality, branded, British-heritage inspired wardrobe classics it epitomises what it is to be unapologetically British, irreverent and carefree. Since 1999, Jack Wills has expanded to become an international brand including stores at Grand Avenue-The Avenues, Al Kout Mall, The Dubai Mall & Red Sea Mall, Jeddah.